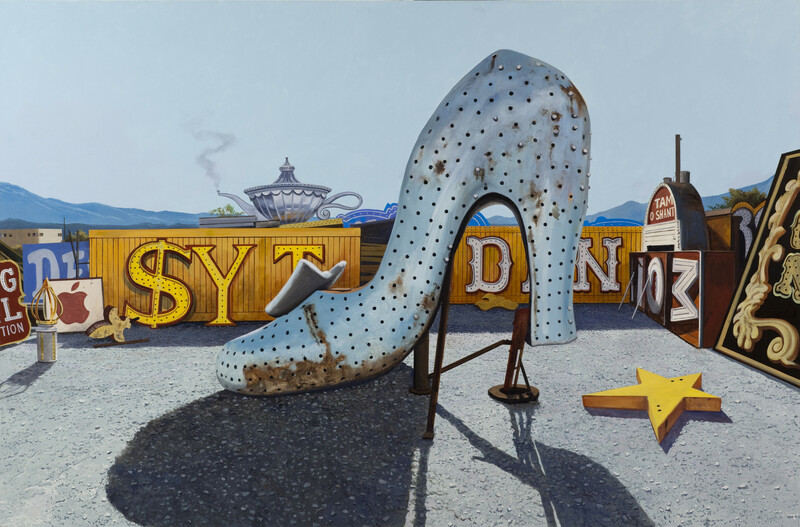 Blagg's wildly popular series of the Boneyard, Las Vegas. 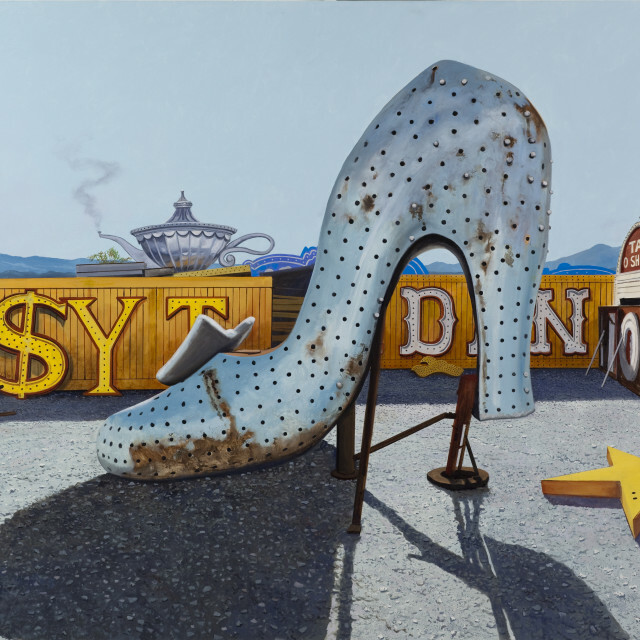 The Boneyard, housed in the Neon Museum in Las Vegas, is a repository for the derelict neon signage that made the city iconic decades ago and has been the subject matter for Blagg in this ongoing series. The Texas native has been a fixture in the Fort Worth art scene for over four decades. His work has received awards from Preservation is the Art of the City and the Hunting Prize and his work is included in the collections of Chase Bank, Fidelity Investments, The Grace Museum, Abilene, TX, Museum of the Southwest, Midland, TX, and the Old Jail House Arts Center, Albany, TX. His public art includes the DFW Terminal D Project and the Worthington Hotel in Fort Worth, TX. Within the two studio spaces of the gallery and the gardens are new works by Artspace 111 artists Alice Bateman, Dennis Blagg, Michael Bane, Michelle Brandley, Danville Chadborne, Matt Clark, David Conn, Barbara Dybala, Ann Ekstrom, Pat Gabriel, Sarah Green, John Hartley, Kelli Holmes, Cindi Holt, Carol Ivey, Jill Johnson, Loli Kantor, Nancy Lamb, Leslie Lanzotti, Jesus Moroles, Jo-Ann Mulroy, J.C. Pace III, Jo LeMay Rutledge, Charlotte Smith, and Fred Spaulding. The show will be on exhibit beginning FWADA Fall Gallery Night September 8, 2012 from 12 - 10 p.m. and run through October 13, 2012. Enjoy beer and wine by Ben E Keith, food by Avery Jane's Catering and Yes!Taco, music by Franklin Tirrell and Fort Worth National Band. Fall Gallery Night is free and open to the public. Artspace 111 is dedicated to its vital role in the city of Fort Worth, and to making contemporary art approachable to individuals of all ages. With its sculpture and distinctive architectural character, the gallery offers a striking setting to host corporate and private events, and is also available for tours and other social gatherings. Artspace 111 is located east of Downtown Fort Worth at Hampton Street and Weatherford. The gallery is open Tuesday – Friday, 10 – 5 pm and Saturday by appointment. To schedule a private viewing, contact Margery Gossett by calling 817.692.3228 or emailing art@artspace111.com.